On Isla Nublar, a remote Costa Rican island, a theme park like no other is being made. It is filled with real genetically engineered dinosaurs, with the aim of bringing the pre-historic world to life. This park is the brainchild of the self-indulgent and fabulously wealthy Richard Hammond and sponsored by the genetic engineering company InGen. Hammond invites a group of experts to survey his new park for the weekend. Among them are palaeontologist Alan Grant, palaeobotanist Ellie Sattler, eccentric mathematician Ian Malcolm, and apprehensive lawyer Donald Gennaro. Also included in the party are Hammond’s grandchildren: dinosaur-mad Tim Murphy and his littlesister Lex. Despite Malcolm’s warnings that the park is inherently faulty and will surely fail, Hammond insists that the group take a tour of the dinosaur-filled island. As Malcolm’s predictions begin to come horribly true, each character is faced with the ultimate goal of humanity – to survive. If you enjoy a good page-turner (and who doesn’t) this novel is for you. My copy of Jurassic Park is extremely well worn, and for good reason – the story is great. Of course, a certain amount of acceptance is required. Critics have complained for ages that the premise upon which Crichton based creating the dinosaurs in Jurassic Park is not viable. To them I say, ‘well of course it isn’t – otherwise wouldn’t someone have created some real dinosaurs already!?’. The premise fits into most peoples’ working knowledge of genetics and leads to a well-constructed plot line. 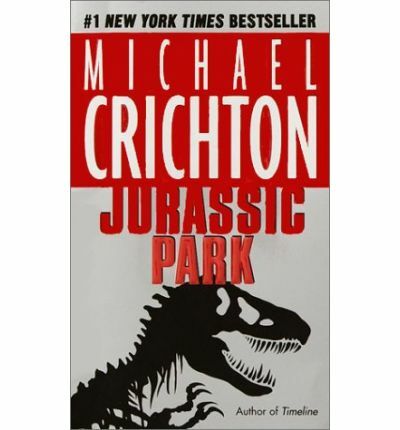 Unlike some of his later works, Crichton really got this one right. It’s no coincidence that this is his best-known book. The story is fast paced and always interesting. It explores many aspects of science – palaeontology, biology, biochemistry, genetics, medicine, mathematics, and the hazier science of human interaction. The storylines diverge and reconnect seamlessly, giving the reader many viewpoints throughout. All the main characters’ motivations and thought processes are explored in a way that makes them relatable if not always likeable. In particular, the somewhat anti-hero Malcolm makes a lasting impression on the reader. There is also a refreshing lack of stereotype, which lends itself to the originality of the whole novel. If nothing else, I urge you all to read the book and judge it on its merits. Although I freely admit the movie is also one of my favourites, it has nothing on the original. Trust me, you won’t be disappointed.